Farmers, homesteaders, and students all tend to be frugal folks, and we work hard to keep the NOFA Vermont Winter Conference accessible to as many people as possible – while still paying our great presenters for their time and managing all the logistical costs of a three-day conference attended by 1,500 people. One of the ways that attendees can reduce their cost of attendance is by volunteering. Volunteers are critical to making the conference run, from stuffing registration folders on Friday night to slicing bread at the hospitality table, directing people to their workshops, and cleaning up after the ice cream social. Volunteers receive a $15 discount off their registration for each 2-hour shift (max two shifts per person). You must confirm your volunteer role before registering to receive the discount; please contact the NOFA-VT office to volunteer! The other way to reduce costs for some attendees is through scholarships. 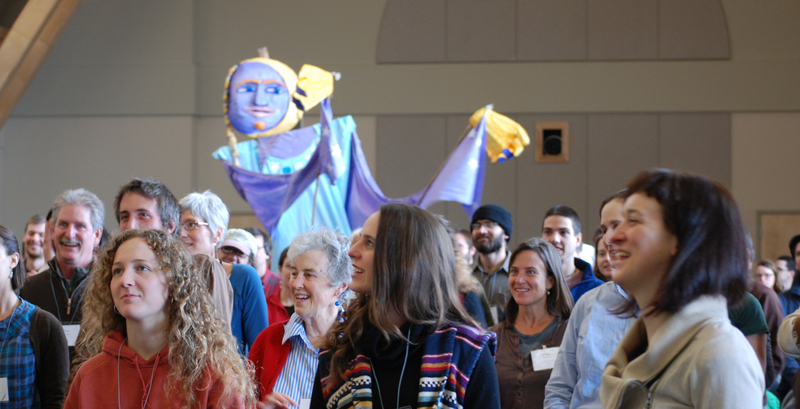 There are three scholarship opportunities available from NOFA-VT.
NOFA Vermont intern Maggie Callahan organized this Friday’s Community Celebration at the Monitor Barn in Richmond (we hope you’ll join us! ), and provided critical support for planning Agricultural Literacy Week; the following is an account of how she got here. Click here to learn more about Ag Lit Week, our second annual statewide celebration of Vermont’s farms and farming communities. Three and a half years ago, I came to the University of Vermont already declared as a Nutrition and Food Science major in the College of Agriculture and Life Sciences. Like an average college student, I considered many times whether my studies would ever benefit me in the real world. Am I really interested in the biochemistry of a plant cell or the importance of valence electrons? If I am to be honest, I never came into the food systems world in search of understanding the way food works in the body. I study nutrition because I simply love food. I love touching it, smelling it, making it, buying it, and most importantly eating it. My relationship with food is not based on the scientific benefits protein will provide when I eat a slice of grilled chicken. Rather, I want to know where the chicken was farmed, how the chicken was treated, and who I am supporting by selecting a specific package in a grocery store. This is where my interest in the agricultural world stems. This past semester, my involvement with NOFA Vermont has exponentially broadened my view to the vast world of farming. For my internship, I have worked on organizing and developing Agricultural Literacy week throughout the state of Vermont with the help of nine wonderful mentors in different counties. Agricultural Literacy week, I learned, is a week-long celebration and educational opportunity for Vermont residents to grow their understanding of why agricultural practices, whether that be locally grown, organics, or sustainability, are so important to the function of this state. We hear “support your farmer,” “buy local,” and “go organic” on a regular basis, but the point of Agricultural Literacy week is to find a meaning in those statements for every individual at every age. For children, agriculture might mean visiting a farm or reading a book based on the life of a fruit or vegetable. For a teenager, agriculture might mean conducting a science project on the importance of fermentation in food production. For an adult, agriculture might mean a face-to-face interaction with the producer of the food on their family’s plate, and an understanding on the benefits, socially and economically, of buying local. For me, I have found that agriculture is much larger than a definition or a project. Understanding and appreciating agriculture comes with a fulfilling feeling of community awareness, health appreciation, and an intense desire to educate. Throughout the planning of Agricultural Literacy week, I have found that my hope for my future, as well as the future of my fellow Vermont residents, is to spread the extremely important fact that our health and the health of our loved ones lies in the hands of the farmers that feed us. Knowing who grew the potatoes and turnips in your stew or who raised the turkey on your plate at Thanksgiving allows you to trust in the food system. The importance of awareness is critical to appreciating what we put in our bodies and further, what our children put in their bodies. Through this experience, I have found that spreading the word on supporting local food systems or even just knowing where your food is coming from, can help change the way our communities function and potentially fix our country’s detrimental health crisis. As my personal project, I have worked extremely hard to bring together members of the Chittenden County community to enjoy a free, completely locally sourced dinner and local live music, in order to start the conversation about the importance of agriculture. Please join our community event this Friday, November 22nd from 4pm-8pm at the West Monitor Barn in Richmond. We will be preparing a delicious winter vegetable soup, a Shelburne Orchard-sourced apple crisp, and enjoy donations from Cabot Cheese, Red Hen Bakery, the Vermont Youth Conservation Corporation, Jericho Settler’s Farm, and Bigelow Tea. Join us at four to be part of the meal preparation, or show up at six to eat! All community members of all ages are welcome to reap the wonderful benefits that our local farms provide us. The event is free; donations will be accepted. A successful farm requires solid business and management skills as well as the ability to judge when a tomato is ripe or a calf is sick. There are a number of resources in Vermont designed to help beginning (and experienced) farmers cultivate their management, accounting, planning, and organizing skills – and many of them have enrollment deadlines coming up soon! Jake Torrey of Honey Locust Farm in Bradford, VT, is a 2013 Journey Farmer. One such program is NOFA Vermont’s Journey Farmer program, designed to help beginning farmers succeed by matching them with experienced farmer mentors, providing them with educational opportunities (including free entrance to our upcoming Winter Conference and an educational stipend), and providing personalized technical and business planning assistance. The application period for this program is currently open through December 18. The Journey Farmer Program is for farmers with a few years of experience, secured access to land, and the intention to farm commercially in Vermont. 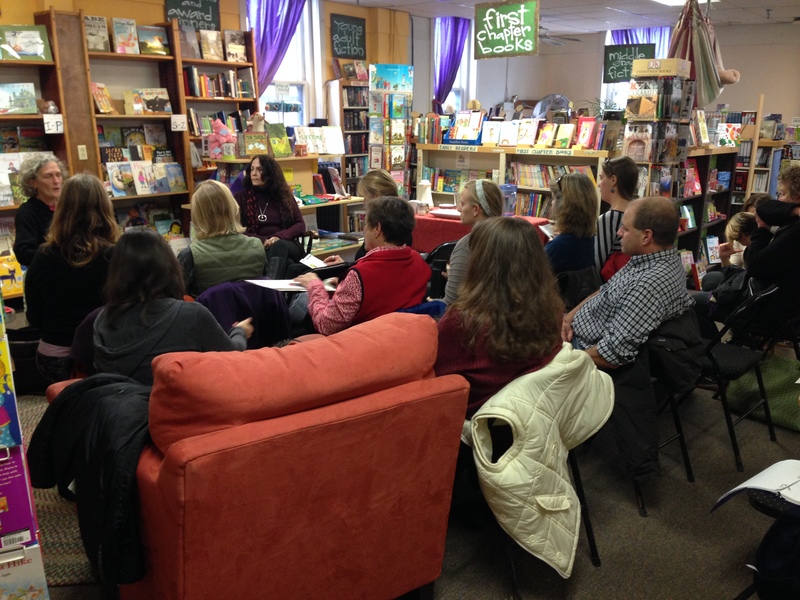 This pas t Saturday, Bear Pond Books in Montpelier hosted author Gail Gibbons and NOFA’s own Education Coordinator, Abbie Nelson, for a short discussion on local foods and their role in schools. The two women discussed the incorporation of healthy practices into school systems and the importance of agricultural education for our youth. Amongst the crowd were several teachers from Barre Town School, and other educators across Washington County. Throughout the talk, Abbie focused on the ways that Vermont FEED (a partnership between NOFA Vermont, Shelburne Farms, and Food Works) has worked statewide to get local food into schools. She discussed the importance of young students associating a fruit or vegetable on their plate with where it came from on a farm or in a garden. Abbie also introduced the New School Cuisine cookbook, which will be released within the month to every school in Vermont as well as every Childhood Nutrition program throughout the nation. This cookbook includes a wide variety of farm fresh, healthy recipes in large serving sizes for cafeteria use. It allows students to associate with healthy foods on a daily basis in the classroom. Lastly, Abbie discussed the Nutrition Education Guide for schools. The Nutrition Education Guide serves as an educational tool for teachers to assess where they can incorporate nutrition education and the best ways to make it work. Gail Gibbons, author and illustrator of over 150 children’s books, also spoke about her influence on child nutrition education. Originally in the film industry, Gail recognized the need for nutrition awareness while working with NBC television programs. After traveling to many different cities across the country for research, she acknowledged that many children did not know where their food came from. Her first book based on agriculture titled The Milk Makers goes into the development of milk in a cow and the processing it must go through to make it to the refrigerator. 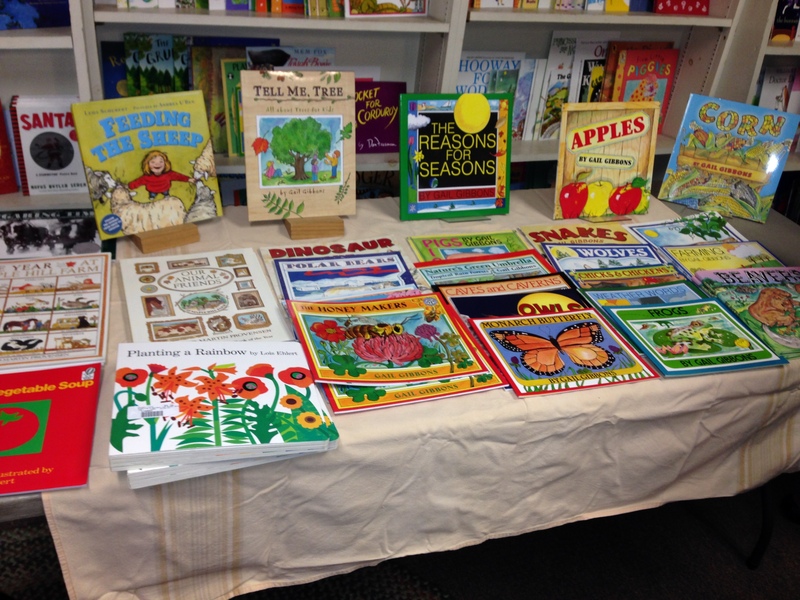 Other books include The Vegetables We Eat, Apples, Corn, and The Honey Makers. Check out Gail’s website and list of publications at http://www.gailgibbons.com/. >> For more upcoming events that connect Vermont’s communities and farms, check out the second annual Agricultural Literacy Week, November 18-24. The 10 raised beds that constitute the NOFA office garden were installed last fall. The garden’s first summer season has been very successful; the garden has proved itself to be a valuable gathering and learning place for community members of all ages. Its most frequent visitors have been local day cares: Gretchen Paulsen’s Childcare Center, the Beary Country School, and the PlayCare Center of Richmond have all come on a weekly or biweekly basis to read books, plant seeds, harvest peas, and sample the garden’s numerous offerings. Some of the produce the preschoolers examined was harvested and brought across the street to the Food Shelf of Richmond. Slightly older students trooped down the hill from the YMCA camp based at Richmond Elementary School. These students explored the culinary possibilities the garden offers, making strawberry dip to devour with snap peas. They also saw production on a larger scale during a field trip to Freedom and Unity Farm, where they helped farmer Gary Bressor with chores. Finally, and on the other side of the age spectrum, senior citizens participated in a series of culinary workshops that took place further down Bridge St in the Richmond Congregational Church. Master Gardener Margaret Lowe taught a jam-making workshop with the late June strawberries, and cooking teacher Adele Dienno taught a “Cooking for One” class later in the summer. These workshops were a valuable opportunity for seniors to socialize and swap old Richmond stories. The garden has had a wonderful first summer, despite the debilitating June rain, and we invite community members to come learn and play as we move in to autumn and reap the bounty of the summer’s harvest.